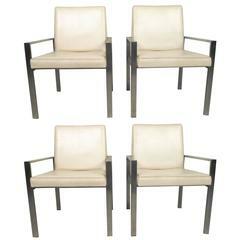 A set of 4 reupholstered midcentury dining chairs. Rare antique folding chairs in various green shades with some red flecks. Gorgeous with an outdoor dining table. Beautiful midcentury HW Klein chair in light brown. This piece is comfortable and Classic, fits great in almost any space. Vintage HW Klein dark brown leather lounge chair in great condition. Classic midcentury design that's a cool (and comfy) statement in any space. Set of six midcentury dining chairs. Original vinyl seat cover. Hardwood construction (walnut) upholstered seat and backrest. Excellent restored with new upholstery. Up to 10 pieces available. Delivery time about 3-4 weeks. Manufacturer Móveis Teperman chair in jacaranda and brass sabots, Brazil, 1950s set of eight.